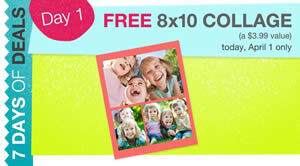 Today only, you can get a FREE 8x10 collage print from Walgreen's! Click here to create your 8×10 collage and enter coupon code 7DDCOLLG at checkout. Select store pickup to get it completely free!